Positivity. Relatability. Mentorship. A genuine sense of connection. These are all things one Columbia High School marketing teacher hopes to offer DeKalb County School District (DCSD) during the 2018-2019 school year. His ultimate goal? Making the world a better place by positively influencing students. “Growing up, we all remember those best teachers—the ones who had the most impact on us. I want to be one of those teachers,” said Taj Red, one of the newest hires at Columbia High. Red is one of over 300 new teachers at DCSD that were hired throughout spring and summer of 2018. Though he is just 22 years-old and is new to the profession, Red has spent plenty of time mentoring peers through Georgia Southern University’s Collegiate 100 program. 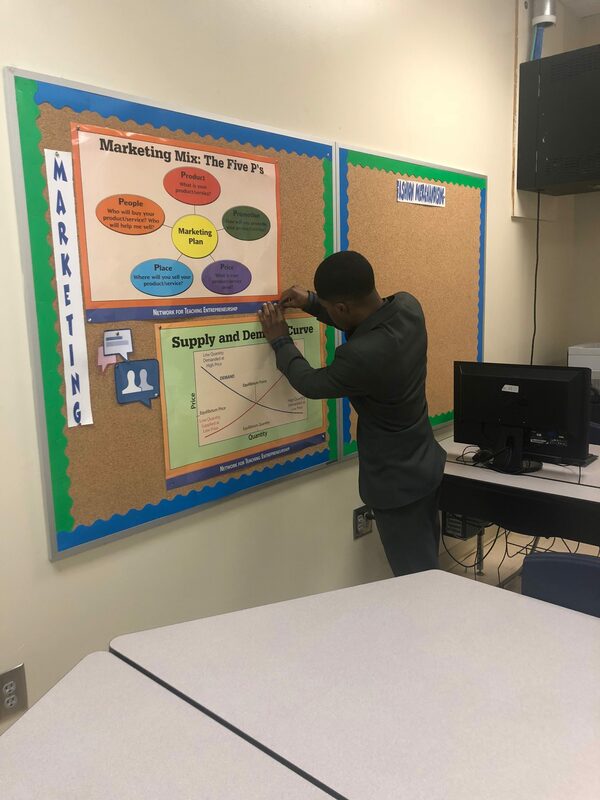 He plans to bring those skills—along with skills learned while obtaining his marketing and logistics degree—to Columbia High School students. According to Red, such skills include how to get a job, how to make valuable connections, how to get plugged into different social and professional circles, as well as how to generally meet new people. While he will be teaching a rigorous marketing curriculum, he concurrently plans to encourage students to get involved at Columbia High in any way possible, be it through Beta Club, Future Business Leaders of America, school government, sports, and any other club that centers around building relationships. “It’s important to be involved and meet new people. You can know as much as you want, but if you don’t have connections, you won’t make it far in life,” Red said. Many might consider Red’s young age as something that puts him at a disadvantage with students. He claims the opposite, stating that being 22 years-old makes him more relatable and able to engage students in the learning process. Another attribute Red hopes to utilize is genuine positivity. He considers teaching one of the most important professional endeavors because of its far-reaching consequence and influence. Red remembers one particular teacher from high school that made a difference in his approach to education. The teacher taught a college prep class and many students were not fond of her teaching style, claiming she was not very nice and hard to get along with. According to Red, however, this teacher’s discipline and direct approach did more to prepare students for college and the world beyond than any other he encountered. Things Red hopes to learn more about is how to appropriately discipline students. Positivity is an important term in Red’s life and one he hopes to adequately relate to students during the 2018-2019 school year. With the right amount, he says, people can make a difference in the lives of others. Red joined other teachers at Columbia High School the week of July 30 to set up his classroom and become acclimated with the building, as well as his new colleagues. He remains eager to begin the school year and begin setting a positive example for students. “I’m already starting to make connections, reach out to people, and find people to grow with,” Red said.